Crape Myrtles are often mistaken as being dead in the spring and are one of the last trees to produce their foliage, usually in late April or early March. Because Crape Myrtles bloom on there “new growth” and produce their foliage so late in the season, trimming in late winter or early spring is best. However,, some light trimming after blooming may be required. 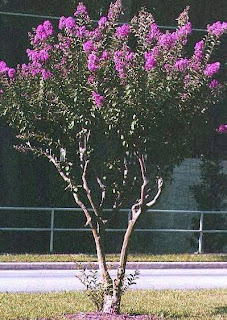 Crape Myrtles tend to grow on several stems, making them a unique semi dwarf tree or shrub, which has a variety of colors and long lasting blooms. It is up to you as the plants owner to prune it how you want it. Trimming all of the lower branches and “suckers”, located at the base of the tree near the soil off close to the trunk and shaping the top yearly will allow the Crape Myrtle to grow as an upright tree. Trimming the weak or brittle inside branches will provide a neater look and more blooms. Leaving all of the lower branches except “suckers” and only pruning lightly throughout the season will allow the Crape Myrtle to grow more dense and shrub like. Trimming the entire tree down 12in to18in from the ground each year works too, the plant will flush itself with all new growth and more blooms. When planting in a row, you are wanting the trees to maintain the same overall height, take a pair of hedge trimmers or a chain saw and cut the tree down to the height you are wanting them to be. 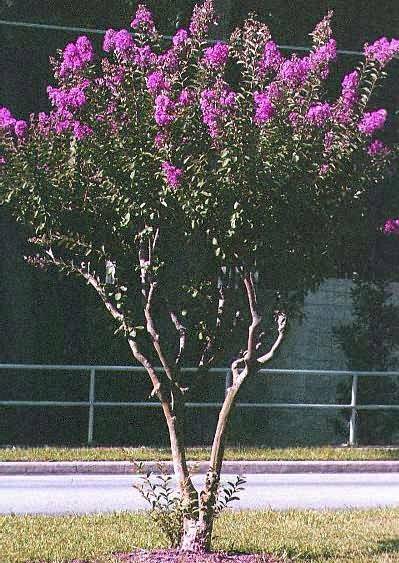 There are a few things to remember when purchasing Crape Myrtles, determine where to plant, what color, if you need a tree, at maturity growing 10ft to20ft tall or a dwarf, growing 3ft to 6ft and how many stems you are wanting at maturity. Crape Myrtles are very hardy, like moist soil, medium to high light, lots of fertilizer to promote more blooms, and will adapt to most areas. Remember, for any plant. dig the hole about twice the size of the container, add a soil conditioner, fertilizer, mulch and keep watered.